It is hard to remain silent when the news we get from Mexico is so consistently depressing. This beautiful country is divided by feuding drug cartels that spread fear and chaos. Our Mexican brothers are killing their Mexican brothers and sisters. In the city of Juarez alone 36,000 people have been killed since 2006. Who will stop this violence? I have wanted to write an article on Our Lady of Guadalupe and Mexico City for many years but always pushed the project aside for one reason or another. I had been busy writing about Hindu gods and pilgrimages to India. During journeys that took me all over India, I realized that ancient India and ancient Mexico have a lot in common. Both countries were home to sophisticated civilizations that used precise measurements for time and for physical space. They lived close to nature and made ritual offerings to propitiate and please their gods. The ancients in India and Mexico were superb mathematicians and astronomers who built temples according to sacred dimensions that, in some instances, are identical. Their giant temples and monuments still stand today bearing witness to a glorious past. Both countries were conquered by invaders who plundered their natural resources and, as a result, both countries today are referred to as developing countries, poor nations. There is a painful difference, though. In India, past traditions evolved with time yet remained current, and ancient Hindu gods are still being worshipped in an unbroken succession. The plant never lost its roots. Every time India was conquered by a new ruler, Hindus somehow managed to assimilate the god of their conqueror into their existing pantheon. In Mexico, on the other hand, ancient traditions largely stayed in the past and, today, the gods of their forefathers are relegated to museums. On my first trip to Mexico City, I woke up early in the morning to a voice talking in my head. Though this is rather unusual, it didn’t seem so at the time. The voice spoke English like a newscaster and, lying on my queen-size bed under crisp, white sheets, I listened to a running commentary on historic and modern times in Mexico gone wrong. I could have switched off this voice, telling myself not to give in to crazy notions like listening to a voice in my head, but I didn’t, because the things the voice said made sense. I had come to Mexico City primarily to visit Our Lady of Guadalupe and intended to go to the Basilica straight away. Perhaps the voice in my head was fate deciding otherwise. Circumstances first brought me to the National Museum of Anthropology that houses treasures recovered from the Olmec, Aztec and Mayan civilizations. Some of Mexico’s most powerful gods live there and, sadly, they are referred to as historic. 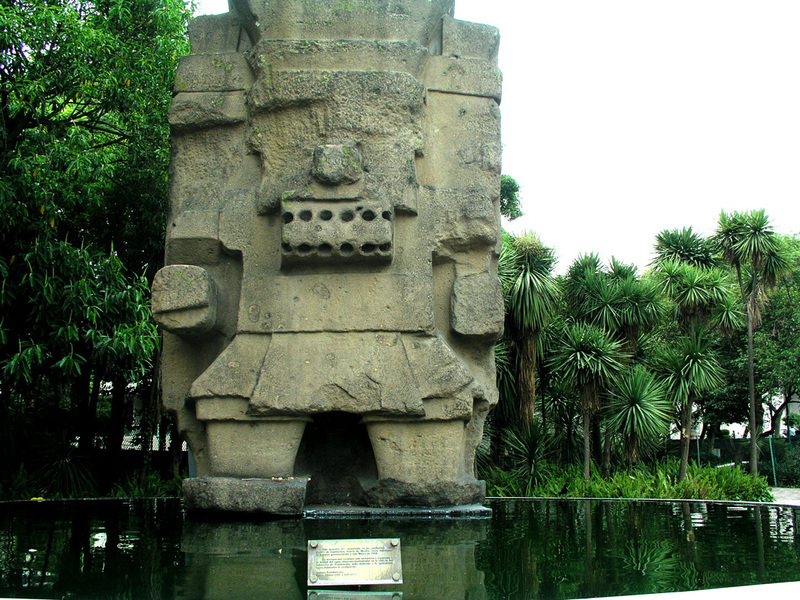 The first god I encountered was Tlaloc, the Aztec god of water and of rain, who stands as a gigantic statue over a fountain near the museum entrance. I had heard a story that, true to his name, Tlaloc produced an unseasonable heavy rainstorm that hit Mexico City when his statue was excavated and brought to its current location. Looking up at the massive statue, I rubbed my head to get rid of a throbbing headache probably due to being unaccustomed to the city’s high altitude. Some birds nearby happily dipped their heads into the fountain’s green water and splashed around as if to invite me to do likewise. Just then I remembered a Christian priest in the U.S. telling me that Tlaloc is another form of the Indian god Indra and that his waters have healing powers. I splashed some fountain water on my head and neck and immediately felt refreshed. My headache left me after some time. I had been under the impression that all of Mexico was poor and backward. Though poverty exists, Mexico City certainly is not backward. I saw a beautiful city with lush trees lining wide avenues and dignified people walking along sidewalks past chic stores and cafes. The National Museum of Anthropology is one of the finest museums I have seen – better than the museums in Vienna, a city famous for preserving art and historic treasures. Upon entering, one walks out into a patio that is surrounded by exhibition halls featuring Mayan, Olmec and Aztec artifacts. I passed an interesting fountain shaped like a huge umbrella from which water is dripping and cascading to the ground. Outside the spacious hall with the Aztec exhibit is a model of Teotihuacan, an ancient city that contains some of the largest pyramids built in the pre-Columbian Americas. The inhabitants must have kept God in the center of their lives and activities to build their city around pyramids and temples. As I walked over the beautifully inlaid marble floor of the Aztec exhibit hall, I wondered what visitors would do if all these gods and goddesses would come alive. 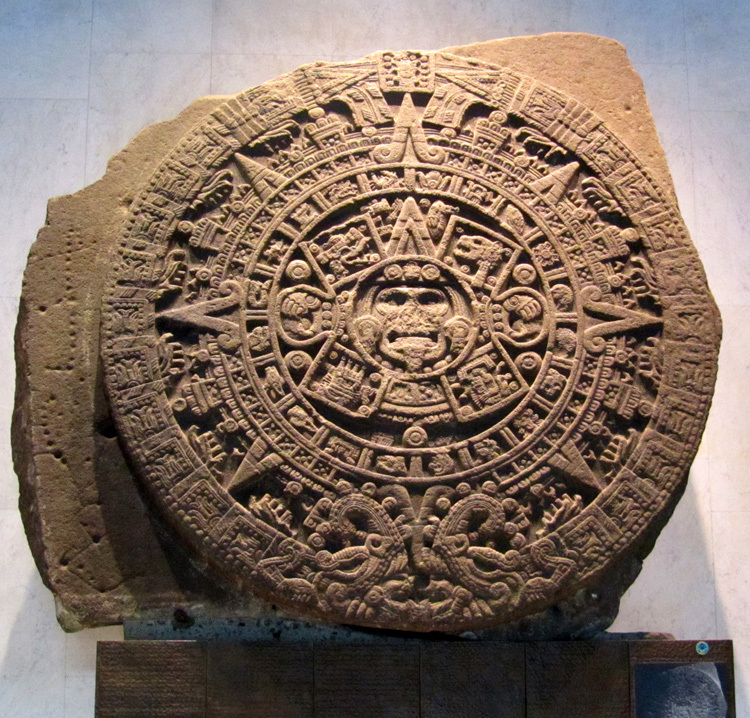 I passed a tour group huddled before the perhaps most famous artifact in the museum – the round Aztec Sun Stone, a calendar which consists of a 365-day solar agricultural calendar cycle and a 260-day sacred ritual cycle. Today, people wear this beautiful Aztec calendar on their T-shirts but hardly know its significance. Coatlicue’s appearance could be described as terrifying but, to me, it was familiar because for so many years I have been worshipping the Hindu goddess Kali. My Divine Mother Kali is the power of time that devours everything. She creates and she destroys. 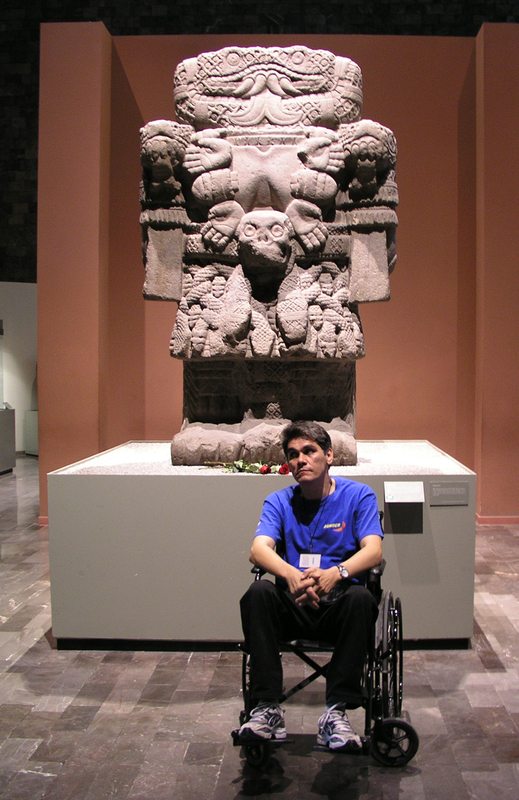 Awed to find my Divine Mother in Mexico City, I knelt on the museum marble floor and bowed before Coatlicue. Just then I heard a booming voice behind me calling out, “Thank you, thank you!” Suddenly, a man in uniform pulled up in a wheelchair next to me. “I am glad that you pay respect to our goddess,” said Angel Rodriguez, a guide from the tourist office. He went on to explain that Coatlicue represents the creative power of Mother Earth as well as the three planes of the universe: heaven, earth and the underworld. From her neck upward, she represents heaven. Instead of a head, Coatlicue has two emerging serpents that symbolize the dual nature of life and her role as creator/destroyer. To Hindus, the Shiva/Shakti (male/female) principle is of utmost importance. The goddess Kali symbolizes duality through her four arms. Her right hands promise fearlessness and give boons while her left hands hold a bloody sword and a severed demon head. One could call her right arms good and the left ones bad but, in reality, she is beyond good and bad just like the sun can’t be called good or bad. Sunshine gives us life but can also scorch us. Kali’s color is a deep bluish-black, and she stands on the prostrate body of her consort Shiva whose complexion is pure white. She is the visible manifestation of his power. Without her, Shiva cannot manifest, and without him, Kali cannot exist. Shiva and Shakti are eternally united. Angel quite actively moved around considering that he was in a wheelchair. I could get a glimpse of his passionate devotion to this ancient mother goddess watching him and listening to him as he pointed to different parts of this majestic Aztec goddess. “From the neck to her skirt of snakes, Coatlicue manifests Earth,” said Angel. “We see her arms turn into serpents. The serpent in old Mexico represents the reproductive power of Mother Earth. On the neck, she has a necklace of hands and human hearts. The heart, according to Aztecs, is the center of Man, religion and love. It is the beating pulse of life. Sacrificing the heart meant liberation of life blood, leaving the seed of life to germinate. Coatlicue’s hands are representative of giving life. Her stomach is a symbol of death, hence the representation of a large skull. “When we die, we all go back to the womb of Mother Earth,” said Angel. In Hindu iconography, skulls are also present in the more fierce gods and goddesses. Ma Kali wears a garland of 50 skulls representing the fifty letters of the alphabet which are the written form of sound from which, Hindus believe, all creation evolved. One friend once pointed out that the skulls around Ma Kali’s neck seem to be smiling. The skulls also symbolize our egos. When Ma cuts our ego, all tension is gone. 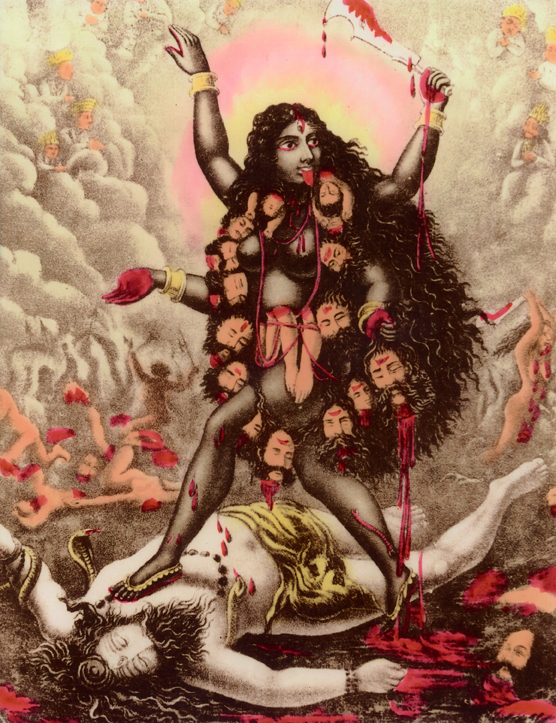 Ma Kali wears a skirt of severed arms that represent our actions. While we are entitled to work, the result of our work belongs to her. The middle portion of Coatlicue’s body from her skirt down to her feet represents the underworld. Her feet are eagle claws that can dig into the earth and aid in agriculture. Underneath her serpent skirt, out of the maternal uterus, comes a serpent giving birth to the sun god named Huitzilopochtli. According to the legend, Coatlicue was sweeping on top of Coatepec, a mountain of serpents, when she found a package of feathers. She hid the feathers under her skirt and shortly after found that she was pregnant with Huitzilopochtli. Her daughter, the moon, and her sons, the 400 stars of the south, became jealous and decapitated her. But she did not die because Huitzilopochtli protected her. Born a fully-grown man in a magical birth, Huitzilopochtli in warrior mode decapitated Coyolxauhqui, the moon, and cut off her arms and legs – hence the moon is round. Angel took me behind the statue of Coatlicue and pointed to a stone leaning against the pedestal the goddess stands on. 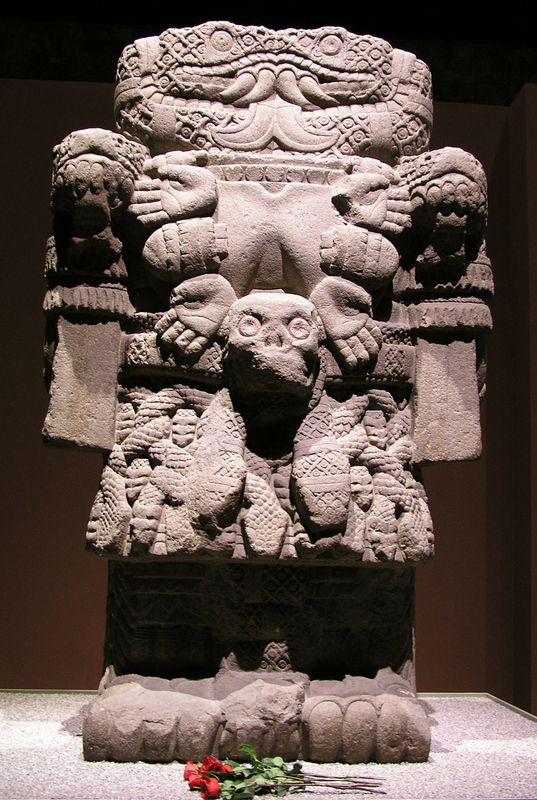 This stone, which encompasses the soles of Coatlicue’s feet, depicts a fourth universal plane – heaven, earth and the underworld being the other three. It depicts the union of Tlaloc, the god of water and rain, and Tlaltecutli, a sea serpent that is an embodiment of raging chaos before creation. Between them, a round shield and a square within portrays the Earth with its four cardinal points of north, south, east and west. The Earth, also represented by Tlali, Chimalma and Tonantzin, is shown within as a circle. “Long before Europeans, the ancient people of Mexico had the knowledge that the earth was round,” said Angel. I was busy taking photographs of Coatlicue. The museum kindly allows photography provided one does not use flash. When I turned around, Angel was gone. He was gone so abruptly that I questioned in my mind whether he was real or not. Was he a physical form of the voice in my head I heard in the morning? He came quickly, gave me wise explanations, and then, he was gone. I would have liked to ask him more about the goddess Tonantzin who used to be worshipped on the hill of Tepeyac where Our Lady of Guadalupe first appeared. Although I had the best intentions to go straight to the Basilica of Our Lady, fate had other plans. I was taken outside Mexico City to Teotihuacan, a vast archeological site with a soaring sun pyramid and a huge moon pyramid linked by the wide Avenue of the Dead. Some scholars estimate that this city may have been established around 100 BC and that by the fourth century some 200,000 people lived there. The city covers nearly eight square miles and was larger and more advanced than any European city of the time. Still, to this day, Teotihuacan is shrouded in mystery, and nobody truly knows who founded this city – be they the Totonacs, Otomi, Zapotec, Mixtec, Maya or Nahua peoples. Archeologists also found influences from the Olmecs and Toltecs. 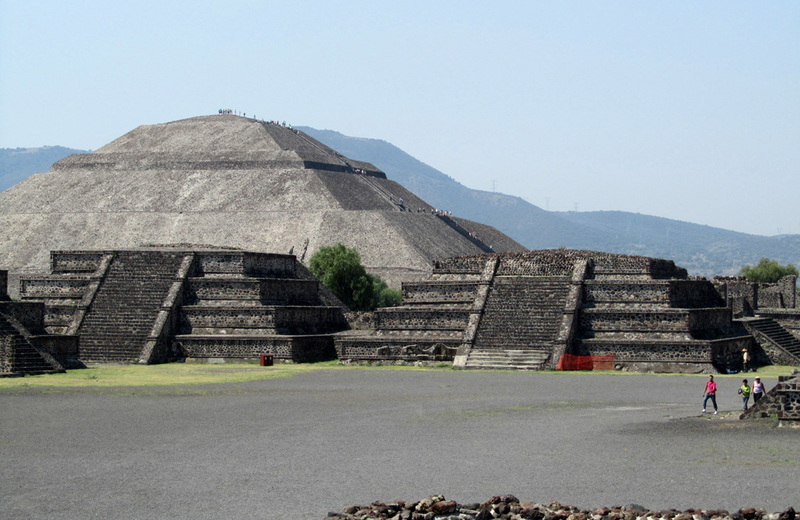 During the time of the Aztecs, Teotihuacan was a place of pilgrimage, the place where the sun was born. The Pyramid of the Sun is gigantic – 738 feet at the base on each side and 207 feet high. When one looks up, one sees people on top appearing small like ants. I decided to climb up the steep ancient steps to the top of the pyramid. It was strenuous, and I sometimes had to pull myself up on a rope strung perpendicular to the steps, but it was definitely worth it. The view from the top is awesome, and I felt that I was sitting on a spiritual vortex that could blast me into the vast universe at any time. Unfortunately, the uppermost portion of the pyramid had been destroyed. Today, one can only imagine what a temple at the top of the sun pyramid must have looked like – columns with colorful paintings on the walls; priests in ornate head dresses running up and down the steps with offerings to the gods. When one hears about Aztec rituals, one is told about human blood sacrifice. Not only Aztecs performed blood sacrifice in the ancient world. The Bible refers to blood sacrifices, and there are reports of isolated cases of human sacrifice in ancient India. Today, some Indian temples still perform animal sacrifice, offering goats or sheep to the goddess, but that is not common. 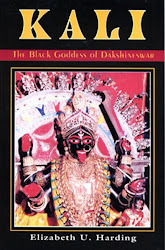 Most people in modern India prefer to worship the goddess with red hibiscus flowers or red roses in lieu of blood. History calls the Aztecs barbaric and bloodthirsty because they performed human sacrifice in order to worship their gods. There is little else known about their rituals besides ripping out human hearts and filling stone tubs full of blood. Surely, there must have been many other aspects to Aztec rituals. If I could go back in time and look at things through Aztec eyes, I would probably call Europeans of that age bloodthirsty and barbaric. Aztecs killed people to offer the most precious gift, namely human life, to propitiate and please their gods. Europeans, on the other hand, killed Aztecs for power and material gain. When the ancient Divine Mother goddess could no longer bear to see her indigenous children killed, she stepped in. I left the holy grounds of Teotihuacan and was finally en route to the Basilica of Our Lady of Guadalupe, the Queen of Mexico and the Empress of the Americas. I came on pilgrimage to pay my obeisance to her likeness on a miraculous cloth that hangs in her temple. Truly, the appearance of Our Lady of Guadalupe ten years after the fall of Mexico City was miraculous. The legend tells of Saint Juan Diego, a poor Indian native of Cuautitlan, who walked on a cold December morning past the Tepeyac Hill. He saw a beautiful lady standing on top of the hill. Speaking to him in Nahuatl, the holy Lady revealed to Juan Diego that she was the Divine Mother of God. She asked him to go to the bishop in the city and tell him to build a temple for her on this hill. Juan Diego followed her command and, although he managed to gain an audience with the Spanish Archbishop, the bishop did not believe his story. On his way back, Juan Diego passed the Tepeyac Hill and again saw the holy Lady standing there. She told him to go back the following day and tell the bishop to build a temple for her on this hill. The second time Juan Diego came before the bishop, he was again met with disbelief. He dreaded to walk home past the Hill of Tepeyac. When the Divine Lady appeared to him once more, Juan Diego plaintively asked her not to request him to see the bishop again. He pleaded that it was impossible to convince the bishop. The Lady smiled and commanded Juan Diego to climb up Tepeyac Hill and gather the Castilian roses blooming there and bring them to the bishop as proof. To his surprise, Juan Diego found roses blooming out of season on top of the hill. Juan Diego went back to the bishop and, as instructed by the holy Lady, opened his poncho to hand over the Castilian roses. To everyone’s surprise, an imprint of the holy Lady of Tepeyac was clearly marked on the rough cloth of cactus fibers on Juan Diego’s poncho. This was enough proof for the bishop, and he fell to his knees. The holy Lady who spoke in Nahuatl to Juan Diego calling herself “Coatlaxopeuh” (or Coatlicue?) was renamed by the bishop “Our Lady of Guadalupe” after a Spanish town that was similar in sound. A chapel dedicated to the Virgin was built on Tepeyac Hill over the ruins of a temple to the Aztec mother goddess Tonantzin. 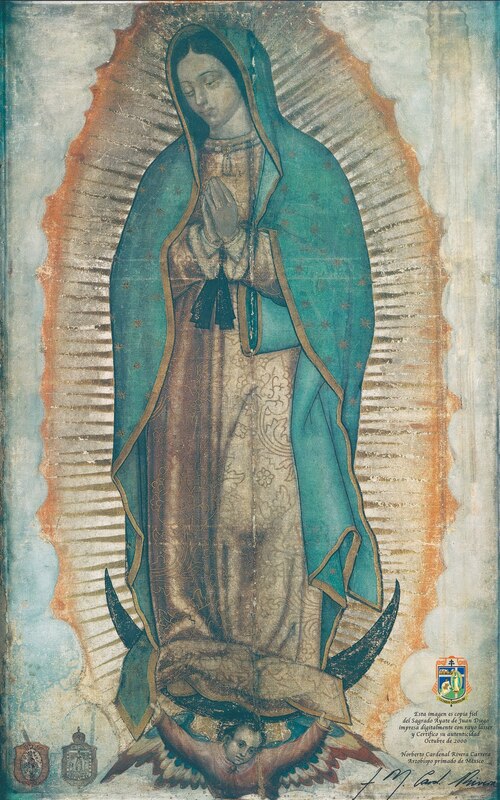 The miraculous image of Our Lady of Guadalupe on the cloth appealed to both conquerors and conquered. The Spanish saw an image of the Holy Mary, but indigenous Indians in Mexico saw the brown-skinned image of Tonantzin and, thereby, stopped resisting conversion to Christianity. This saved the lives of so many local people who previously resisted. The color and form on this divine cloth has not faded since the 1500s. I stood in awe in front of the Divine Mother, grateful to church authorities who permit people to view this cloth from such close proximity. I sat down in the pews, taking in the holy atmosphere. The Basilica is so spacious that it can accommodate thousands of pilgrims that stream in daily. While the Basilica’s architecture reminded me to modern Catholic churches in Europe, the people with their passionate intensity of devotion took me back to the temples in India. As I watched a priest perform mass assisted by a couple of altar boys, a procession of native Indians slowly passed the wide altar with its multiple steps. An old man was leading the procession, and I was fascinated by the loving way he carried a brightly-painted wooden statue of Our Lady. Watching his demeanor, I did not doubt that the goddess he was carrying was dearer to him than his life’s blood. I saw a woman moving slowly through the crowd on her knees toward Our Lady. Big tears flowed down the cheeks of her guileless face as she fixed her eyes on the Queen of her heart. Such intimacy with God is timeless. The ancient religion of Mexico is there – just masked by a Christian face. When I got back to my hotel room, I remembered the voice in the morning with its running commentary on how Western influence on Mexico for the last 500 some years had stemmed the natural flow of ancient wisdom. In olden days, the people of Mexico lived in a magical, sacred world of spirituality, but they were forced into a Western materialistic value system. Mexico’s conquerors, in order to justify colonialism, resorted to rumors and masked the truth with clever distortions. If a lie is told with authority long enough and often enough, people will be lulled into accepting it as the norm. It is not hard for ruthless leaders to get masses of good people thinking in negative stereotypes and to undermine the confidence of an entire nation. In a materialistic society, people measure success by how much wealth a person or a country has accumulated. Value is placed on education that leads to a well-paying job in a competitive business community rather than on knowledge that leads to wisdom. I remember learning in school about the Age of Enlightenment and the Industrial Revolution and that material progress meant that things will get better and better. In other words, our civilization today should be the most advanced one. The first time I began to wonder about Western claims was when I visited the caves of Ajanta in Maharashtra, India. These pillared halls resembled chapels I had seen in Europe -- except that these caves had been carved into solid granite rock around 200 BC. I can’t think of anyone today who would take the time to undertake such a work. Could anyone today figure out how to build a city like Machu Picchu high on a mountaintop using big boulders of rock that perfectly fit on top of each other without using cement? Looking at world events right now, materialism is on a collision course with nature. Our scientific knowledge has disturbed the rhythm of nature. Who can still read the signs of nature? Who can fix our dilemma? 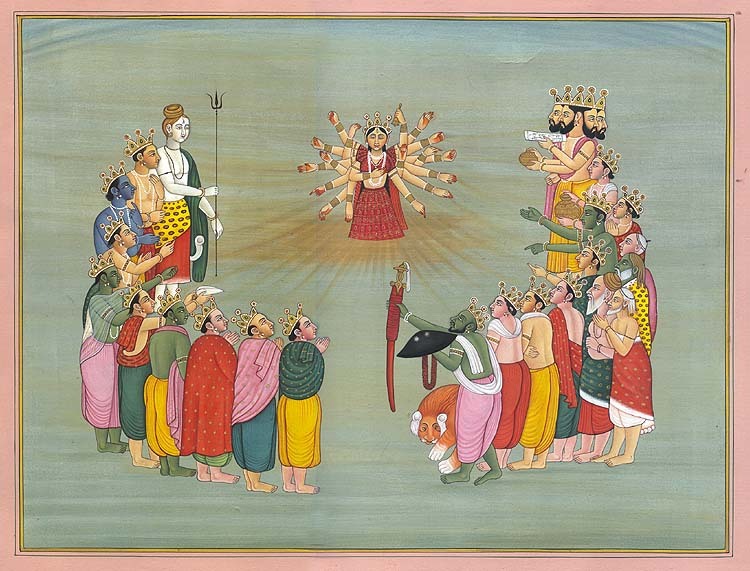 An ancient story in India tells of a time when even the gods were exhausted from warring with demons. In times of trouble, it is time for the Ancient Mother to stand up and fight for us. When the male gods heard that the great demon king Mahishasura had declared himself lord of heaven and ruler of the universe, they got angry. Each god shot forth a terrible light coming from his forehead. Their rays joined at one point, and slowly, the blazing concentration of light took shape in the form of a mother goddess. The gods prayed to her and worshipped her with praise, ornaments and weapons. “Victory to the Mother,” they shouted as the goddess killed the demons and restored peace and tranquility. This story from the Chandi, India’s famous Tantric scripture, has a deep meaning. The demons to be killed are not only outside ourselves, they also reside within us as anger, lust and greed. Lust for more power and more wealth is a sign of materialistic thought. There never is enough money, never enough power to satiate human desire. Greatness may be forgotten for some time but, sooner or later, it will rebound. Will Mexico be able to revive its ancient traditions and make them relevant for the present and future? Many years have gone by since I first visited Mexico City, but I still clearly remember the voice that taught me the ancient way – by situation rather than through books. I learned through experience and am grateful that I was introduced to Our Lady of Guadalupe through the ancient mother Coatlicue. I humbly place red roses at her feet. The Divine Mother Coatlicue is ready to come out of the museum, ready to nurture and protect her children living in the holy land of Mexico. Very interesting comparisons of different cultures(Spanish,native Aztecs and eastern Indians ) and spiritual beliefs ! I am a inner collector of spiritual comparisons myself . I remember as a child I had my grandfather's native American Indian side of naturality and spiritual ways of going to God alone, and then my other grandparents side so closely connected to la virgen details Guadalupe, so much that in our small town there was a statue of her that would make its rounds to every house in the neighborhood and stay 7 days, I remember how the house would be cleaned extra special and no drinking or smoking or t.v. or music or bad language was allowed at all during her visit, its as if a real special person was coming to visit, it is what made me realise and trust in a mother type goddess! Because to the Protestants we were pagans worshipping a woman and the Catholic church constantly put our encyclicals denouncing these rumours and allow us to continue to flock to her pray to her, but with God in mind! I remember 5am processions in the dark with her at the center and candles and chantings calling her our queen the mother of God (theotokos-in Greek) ! Ironically she was our moving force and protection and giver of good things, we believed in God but. I think we all in some silent inner way knew she was God! as I've learned about tonatzin, the pre woman who would appear alot to people in ancient and modern times, i realised that just like other religions, this woman queen of ours was taken hostage to sorta corral native peoples of this country and countries all over the world. In India they know her as ma Kali and ma durge and others like sarswati, Lakshmi. In Russia at tikhon bogodoritza, iveron, any many more. In Greece as portatissa, panagia,and many more! In Mexico, Guadalupe, virgen de San Juan de Los lagos and many more! On Tibet she is known as green Tara, red Tara, blue Tara! In chinese buddhism and taoism as quan yin! To our native people she was tonantzin, don't know exactly if in Sanskrit she is referred to as queen like in the rest of the world, but MOTHER, should be defined as queen and because of that simple term I know this is the same woman who has appeared for thousands of years to local peoples of different cultures but on the same path! Jai Ma! thank you for sharing your story..
Jai Maa! Thank you Usha Ma!